Browser Trends May 2015: Can Microsoft Regain the Edge? It’s the usual story. Chrome had the biggest jump and now stands a fraction under 50% of the market. Firefox and Opera dropped a little, but the biggest loser was Safari. Both the Mac OS and iPad versions decreased but Apple is unlikely to be concerned given their recent $13.6 billion quarterly profits! We’ve known about Microsoft’s new browser for some time. 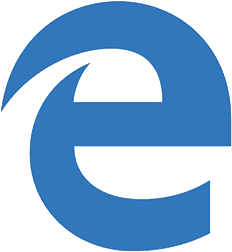 It has now received an official name: Microsoft Edge. It’s a sensible choice. Existing IE users who don’t know or care about Edge won’t notice any difference — they’ll still click that blue ‘e’ icon. The name and logo are a little underwhelming. Perhaps Microsoft could have been more radical? That said, users rarely like major changes (Windows 8 anyone?) Here’s a look at a recent build of the browser to whet your appetite. Mobile usage grew marginally to reach 33.47% of all web activity. The mobile market remains lively and most users stick with the default browser on the device. For iPhone users, that’s Safari — Apple don’t permit other rendering engines. It dropped below 20% for the first time since December 2013. However, the iPhone remains exceptionally popular so it’s unlikely to be a long-term trend. At the lower end of the chart, IEMobile has overtaken the ancient Nokia browser to become the sixth most-popular application. But 2.2% of the market is barely cause for a celebration. Perhaps Microsoft Edge will fare better? I didn't like it at first, but did get used to it and now am sad to see it go! I can't imaging liking "Edge". Hopefully it won't keep us all on edge like IE did. I knew IE wouldn't die that easily. Its ghost will haunt us for ever. I'm surprised they used the name of the engine as the name of the browser. I was hoping Edge would remain the engine, and that the browser would be... I don't know... Let's say "Engine". IE7 and down died a while ago. One thing that Microsoft needs to fix is the upgrade model. We get users stuck on 5-10 year old browsers because they don't auto-update. With Chrome and Firefox, we would have problems if users were still on Chrome 3 and Firefox 2, however this doesn't happen for a simple reason: They auto-update. As such, they seem like better browsers. If everyone on IE was on IE11, we wouldn't have nearly as many of the problems that we associate with IE in general.